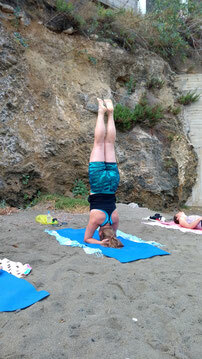 " I have been 3 consecutive years in Kalymnos, Greece with Beatrice as my yoga instructor. Beatrice listens, and she applies what she heard to each individually. You feel seen and nurtured in developing a practise that suits YOU. Not the woman next to you but YOU. She creates a safe space, with only 7-10 women, where key is respect and love. We are all on different levels, but a smoothly all met where we are. I want to give my recommendation to Bea, my yoga instructor at www.beeyogi.net. For the third year in a row, my sister and i went to Kalymnos for a week of yoga with wonderful Bea. Kalymnos is a beautiful place. The island is peaceful and gives a great energy. Bea is a highly competent instructor. Her technical skill and ability to guide in and out of different positions are at an advanced level. I feel safe, taken care of and challenged in my practice with her guidance. Give yourself a gift and take a yoga holiday with dear Bea. " J'ai passé un séjour absolument délicieux sur tous les plans ! Je commence par le décor : l'île de Kalymnos. Une petite île à taille humaine sur laquelle on se sent bien tout de suite. Très jolies plages pour "buller" en journée. Nombreuses tavernes où déguster poissons frais et plats traditionnels. On a l'embarras du choix. Les studios ont tous une terrasse avec vue sur la mer. Pour aller sur la plage, il suffit de descendre quelques marches. Le stage : le matin sur la plage au lever du soleil puis le soir sur une terrasse avec vue sur mer au coucher du soleil. Un rythme paisible s'installe peu à peu. Déconnection totale assurée ! C'était parfois difficile de se lever le matin mais au final, je n'ai jamais regretté. J'ai ressenti chaque jour que ce réveil du corps et de l'esprit en douceur m'avait donné une très belle énergie pour le reste de la journée. Et puis on peut toujours faire la sieste plus tard sur la plage :-) La session du soir se termine par un yoga nidra. La voix de Béatrice, grave et apaisante, m'a emmenée loin, très loin... Sans doute un de mes moments préférés de la journée. Quant au groupe, nous n'étions que des femmes. Un groupe bienveillant, généreux et attentif à chacun. Très belle énergie. Des rires et de l'émotion aussi. Je réserve ma place pour l'année prochaine sans hésiter ! Thank you for a wonderful week. I will be forever grateful. I am glad you introduced me to different kinds of yoga and I really like it all. When I came to Kalymnos, I was sure that meditation/Yoga Nidra was not for me; but I was wrong, the last morning on the beach, I managed to get in a deep feeling of meditation - you told us to think of one or two people we wanted to send some energy and why we wished it. It really worked for me - after the meditation, as I opened my eyes, tears was falling down my face - what a great feeling. You told us about a younger and happy face - teasingly an advertising for L’oreal. It was so strange, two days before, I had exactly the same feeling, when I saw myself in the mirror - fewer wrinkles and more happiness. I have found that happiness comes from your heart and does not need to come from other people. It was my first trip abroad alone and I did not die ;-). It has been great to be allowed to be me and do what I wanted. I have no pain anywhere in my body and have become more supple - lovely. "Lis and I had a great week and enjoyed so much the daily yoga. We found the way you teached very inspiring. "merci beaucoup pour la bonne introduction au yoga! J'ai beaucoup aimé les leçons chaque soir. "Dear Bee, thank you so much for your light and your calmful teach. It was fullfilling and I could catch your recommendations into the daily practice. Muchas gracias for that.